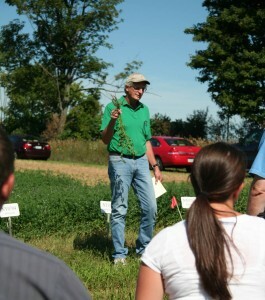 Cornell entomologist Dr. Elson Shields holds an alfalfa plant with a healthy root. His protocol for treating fields infested with alfalfa snout beetle is helping to restore alfalfa crops on NNY farms. The NNYADP is also funding selective breeding of beetle-resistant varieties of alfalfa. Northern NY. The Northern New York Agricultural Development Program, Cornell Cooperative Extension, and the Shields Lab at Cornell University are partnering to offer farmers a cost-sharing opportunity to encourage more growers to treat fields with biocontrol nematodes in areas infected with the highly destructive alfalfa snout beetle. The deadline for expressing interest in the funding is May 15, 2015. Alfalfa snout beetle is the major limiting factor in alfalfa production and stand longevity in all six NNY counties: Clinton, Essex, Franklin, Jefferson, Lewis and St. Lawrence. The pest is also known to exist in three other counties in New York State and in southeastern Ontario. ‘Uncontrolled, the beetle can destroy a new alfalfa seeding in just a year or two, with field losses from $250 to $400 per acre,’ says Cornell Cooperative Extension Field Crops and Soils Specialist Kitty A. O’Neil. To date, the beetle-attacking nematodes have been applied to between 8,000 and 10,000 acres of NNY farmland. A single application is enough to prompt success. ‘Early adopting producers who have applied the nematodes to multiple fields within an area have reported a significant decline in the alfalfa snout beetle population on their farm and are now successfully growing alfalfa again,’ says Cornell Cooperative Extension Field Crops Specialist Michael E. Hunter. The farmer-driven Northern New York Agricultural Development Program is making funding available to help underwrite the rearing and application of the native nematodes. Extension personnel are serving as the application conduit. ‘On-farm research in Northern New York in the past seven years indicates that just a single application of the biocontrol nematodes is required in a field as the nematodes will persist in the field for many years,’ says Cornell Entomologist Elson Shields. The most recent research funded by the Northern New York Agricultural Development Program shows that the nematodes will persist through a corn crop grown after alfalfa in the same field. The project is also encouraging growers to plant varieties of alfalfa that are increasingly resistant to the pest, as identified by the selective breeding project funded by the Northern New York Agricultural Development Program and managed by the Cornell University Department of Plant Breeding and Genetics. Farmers interested in participating in the cost-sharing program will find guidelines on the home page at www.nnyagdev.org. Requests must be made through Cornell Cooperative Extension for Clinton, Essex, Franklin or St. Lawrence counties to Kitty A. O’Neil at 315-854-1218, kitty.oneil@cornell.edu and for Jefferson or Lewis counties to Michael E. Hunter at 315-788-8450, meh27@cornell.edu. The funding for the cost-sharing program was made possible through the $600,000 appropriated to the Northern New York Agricultural Development Program in the 2014-2015 New York State Budget. The nematode biocontrol concept that arose from NNY alfalfa fields is now being evaluated to control pests in berry crops in Northern New York and, with funding through the New York Farm Viability Institute, in grape and organic apple crops elsewhere in New York State. For more information about the Northern New York Agricultural Development Program, a complete list of 2015 projects, and results of the past projects, visit the Program website at www.nnyagdev.org. Four new disease management reports have been posted with data on disease control in small grain cereals with fungicides, resistant varieties, and integrated management in New York in 2014. They are available on FieldCrops.org.